Real Escapes Properties proudly offers this spacious end unit at the well-established East End Condominium. 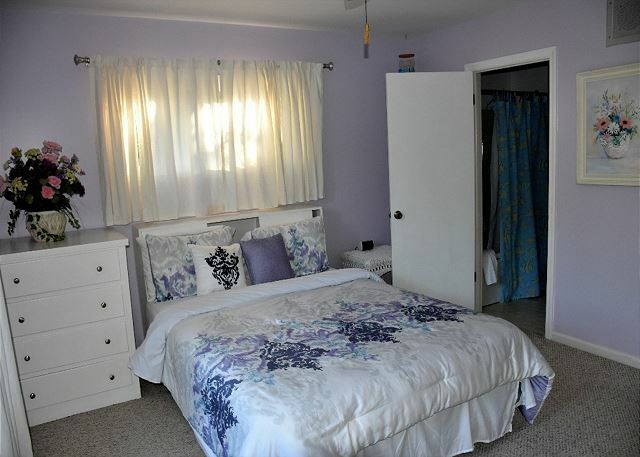 This condo is bright and airy, and easy walk to the main beach. 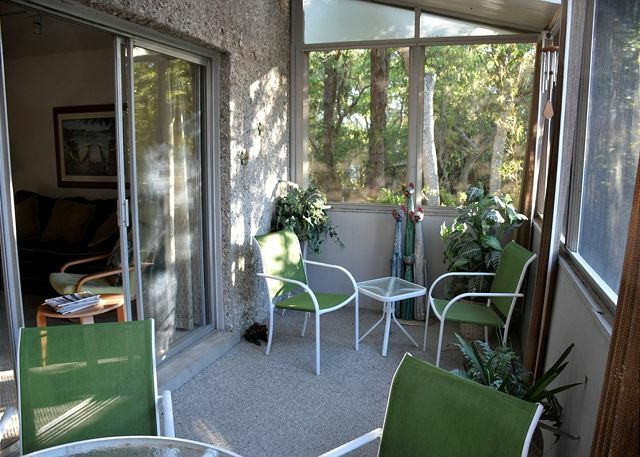 There is a balcony deck on the top floor and a screened porch off living room. The community amenities include a beautiful community pool, phone service, with free long distance, and wireless internet. Occupancy 6. This is our 6th year in the same unit and will return next year. We love the beauty of the island! The unit is very tired which is not an issue, but every year, we complain about the lack of cleanliness. As nothing changes, we continue to deal with it. The beauty of the beach and island out ways my initial elbow grease required to make it a perfect stay. This is always a positive experience for us and we continue to return. The island is a pretty gentle part of heaven. Not to bad considering the weather. Was diapointed that we had to leave a week and a half early and were not offered some sort of compensation with the cost. Great location and a clean , well set up condo. We will stay here again. This is our fourth time staying at East End and we could not be more pleased with the space, rooms and amenities! New this year is the stove, fridge and mattresses in all the rooms. As always, there are plenty of dishes, baking pans, pots and storage containers. We host brunch and dinner for 9 to 15 people every year and this place accommodates everyone easily. 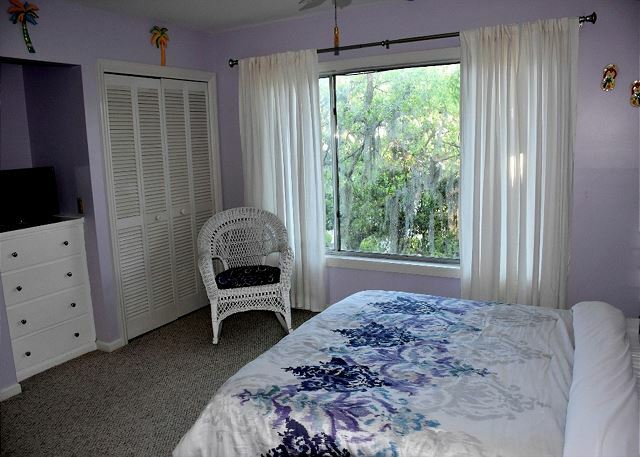 The 2 minute walk to the beach is ideal and the pool is quiet and well kept. We have rented the same unit for the past 5 years and the location sells it. We walk to the beach and town and close to bike trails. Our experiences on the island, town of Brunswick were wonderful. It is close to Savannah and Jacksonville. The staff at the rental agency are great to deal with and the cost of the unit is reasonable. In my opinion, this compensates for the very tired unit. 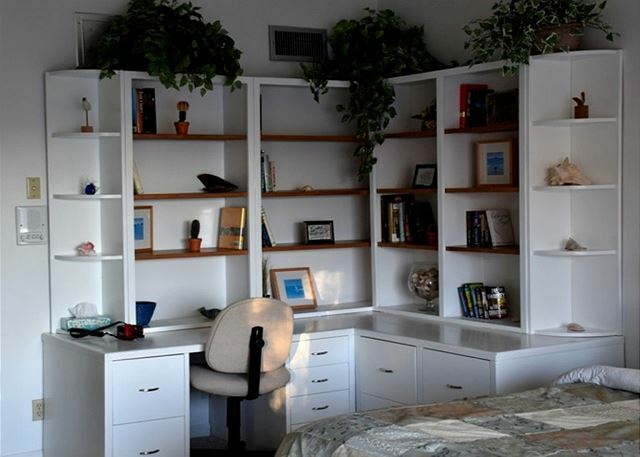 We have family visit and the set up is ideal for visitors with a private third floor master suite with computer desk and sun deck. The unit could be cleaner, baseboards, spills and spatters on walls and cupboard doors. East End #16 is spacious and convenient to the beach and our favorite restaurants on the island. Our family of six enjoyed a week of relaxation and fun based at this condo. The living area, bedrooms and bathrooms were well-suited for our family. The kitchen is well-stocked and the condo layout is perfect. We would like to see new carpet throughout, as there are noticeable stains in the carpet, and the baths could use updating, but we were very satisfied with the space. Some of the decor seems cluttered--there weren't many walls without pictures and some were outdated--but that didn't keep us from enjoying our stay. 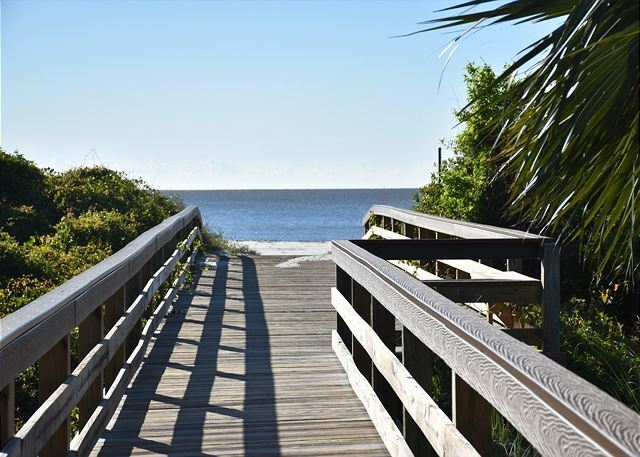 We love historical St Simon's Island, especially the East Beach area. 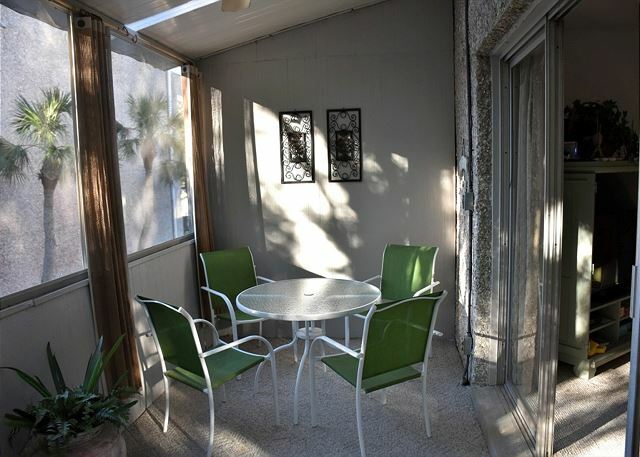 This unit is close to the beach, bike paths, restaurants and village. The unit itself is a little tired, stained and frayed carpets, leaky sundeck. The management staff were very attentive and fixed issues as soon as they were identified. We have reserved for next year due to location, price and wonderful staff. We enjoyed the month of February 2K16 at #16 East End. 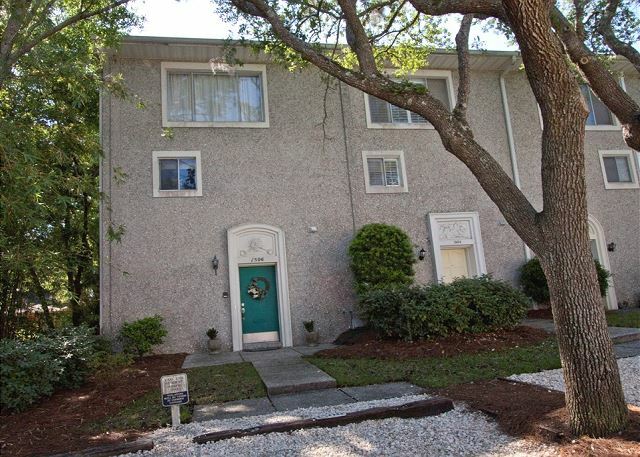 The location is great for access to the beach, nature walks along the marches, walk or bike in adjacent EEnd neighborhoods with quick access to The Village and shopping out Frederica Rd. BUT, the house really needs attention. Bathrooms, kitchen, etc were clean. The carpeting is old and may be beyond professional cleaning but needs that at the least. A dirty trail leads up the steps,through the dining room to the kitchen. It is disheartening to enter & be faced with old stained carpet. We had to live with it and we did. The interior walls, living room, dining and kitchen, stairwalls, all need a fresh coat of paint. This place has not been freshened up in years. Owners, please take note. The third floor beds need new mattresses. They are so uncomfortable. More modern mattresses would be so appreciated. We will stay again in February 2017 & we will enjoy our month south of NJ, but would really enjoy #16 so much more if it were freshened up. Thanks. we enjoyed staying in east end # 16. there were plenty of towels, hot water and the unit stayed very cool. however, there are some updates that need to be made. the carpet is very worn and the stove needs to be replaced. minor issue with the shower rod spring being broken and falling in floor in 2nd floor bathroom. (taped back for short term use).lol A few bulbs were out, would be nice to have some spares in unit. Parking a little tight when all units full. For perspective, we have stayed in several units here over the last 30 years, North Breakers, St. Simons Grand, Ship Watch, Sea Gate, a few houses and the Beach Club. WE stay here when extended family comes The multiple stairs are getting a bit hard on the over 60 aged members. Overall the unit is adequate, no glaring faults, AC unit surprisingly good. We had 3 TVs hit by lightening in this unit about 15 years ago!BTW the old ancient TV's and limited cable are" low rent". The worst one a few years ago was unit 9, had two disasters there , the upstairs BR ceiling literally fell in after a big storm around the time the complex was re-roofed and another time the upstairs toilets( both) stopped up, the plumber , came in to fix it, when we got back sewage was pouring through the LR an Dr ceiling all over the dining room table and carpet upstairs was ruined. We had to move!! Just telling you this for perspective, we love St. Simons and make 2 or more trips a years there, we are not too hard to please and understanding of minor issues. Of course I refuse to stay in unit 9, too many bad memories there! lol. We are interested in any 3-4 BR units on the beach ,condo or house , in this price range for next years trip, preferably not so many stairs my 87 year old mom can't make it up them! Suggestions?? We did not get your message on the disposal until home, but rarely used it so not a problem this trip. We like the location. This is our third year renting thin unit. We like the new refrigerator and the front loading washer and dryer. Taking into consideration that our vacation was late in the season, we were disappointed in the cleanliness of the unit, especially the carpet. We would prefer tile or hardwood or anything but carpet. The furniture was also very dirty. 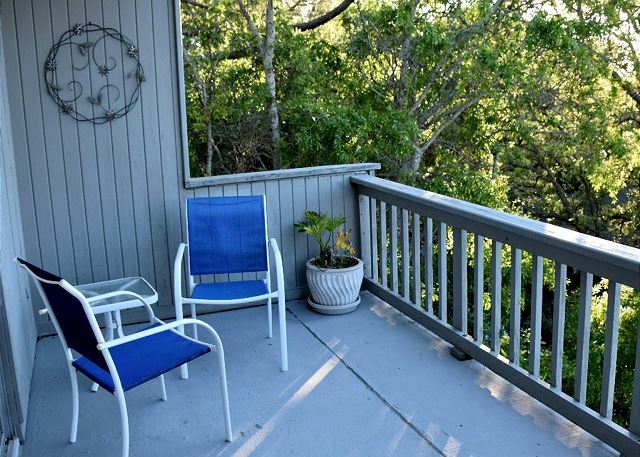 The balcony off the living area is misrepresented in the online photos. The furniture is mildewed because the roof leaks badly. Basically it is unuseable. The kitchen badly needs an upgrade. We are two houses and three condos, around 30 folks when all ar there. We take turns cooking. Really hard to host roast beef night with two burners. No complaints with bedrooms or baths. Cleanliness and kitchen are the primary problems. We enjoyed our stay. The stove/oven was very difficult to use but otherwise we had a great time. The pool and easy access to the beach was great for our family! It was wonderful. It was clean and neat. We had everything we needed. They had closed the closest beach access the whole week but that was something that couldn't be controlled. Condo in serious need of updating! Stove and oven filthy, cookware disgusting, greenery dusty, 4th floor bath - only one light working, mildew around bottom of shower and shower curtain, light bulbs out in family room and hallways, lamp shade in family room needs replacing, queen bedroom bath has shower curtain not attached to anything - just resting on tile, carpet needs cleaning , thankful I had packed Lysol to rid condo of unpleasant odors. We have stayed in other East End condos and all were very nice. We do like location! The unit's location was the main attraction. We rented this unit for the second time. The unit is a little tired, frayed carpets, leaky roof on the sun deck and a freezer that stopped working. The agents were very quick to respond to concerns and cleaned the carpet for us. The repair people came to assess the fridge and sundeck roof and hopefully these will be fixed before our visit next year. These issues were overshadowed by the magnificent beach, lovely top floor and sun deck giving lots of privacy. The living room furniture was very comfy and dining room had lots of room. In summary, it was a wonderful stay on a very picturesque island. Very good. The roof on the balcony off the living area leaks badly. A tile or wood floor would be much easier to maintain. The carpet was pretty dirty. We like the location and have already booked for next year. St Simon's Island is the prefect place for us for a holiday. Many activities in Brunswick and clam peaceful atmosphere on the island. This property is a little tired and needs some TLC. However the management was quick to address any concerns and we will return next year to the same unit. Overall, a very fun and satisfying experience. Problem with the Internet service that was never resolved, but the management team worked hard to try and fix it. AT&T was the culprit. Awesome Location and Very Kid Friendly! It was a great space. It was large enough for a big group and also a spacious kitchen and dining area to make it easy. The location to the beach can not be beat. The board walk is right around the corner your on the beach in literally a minute. 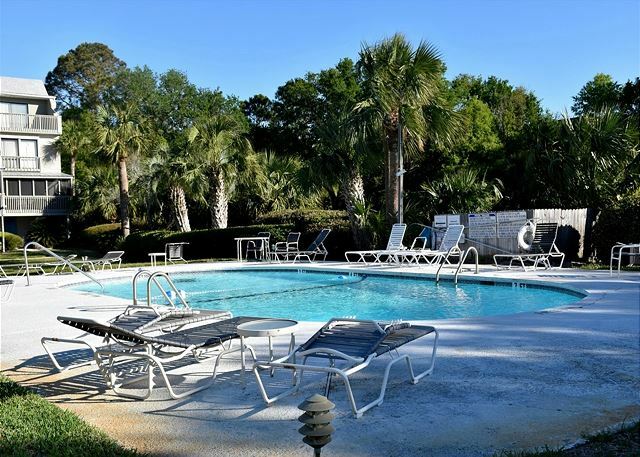 We will definitely stay at this property on our next St. Simons trip! We love East End #16. It is well cared for, well equipped and well decorated. It provides us the space we need to enjoy vacation. Thank Real Escapes and the owner for providing us such a great home for our yearly St. Simons Island getaway.